Delightful Designs by Danielle: Double posting ... Winter Wonderland & PaperWorksCo! Double posting ... Winter Wonderland & PaperWorksCo! I would like to wish all my fellow Canadians a very Happy Canada Day today! Sorry these cards are late today but I've had major computer issues in the last 48 hrs and unfortunately my desktop has died. Thankfully my husband came home this morning and he has hooked up my notebook to the keyboard and monitor for the time being. So .... firstly I have my Winter Wonderland card which follows a 'buffet' style recipe challenge today! I chose this sweet LOTV image which is coloured with copics. Papers are from a gorgeous lush christmas stack (DCWV I believe). The sentiment is from Sentiments 4 You. I am scheduled in for Recipe Fridays with PaperWorksCo for the month of July. Today's recipe is 'O' ... Orange, Octagon & any 'other' embellishment. I used the sweet Mikey the Monkey and went with a funky orange/pink colour combo. I totally went out of the box with this one and coloured the monkey hot pink! Paper is from Echo Park 'Sweet Summertime' and the sentiment is from the Jungle Jesters sentiment bundle. The vines are a die cut. I stitched around the edges to add some detail and my 'other' embellishment is the orange button & twine! I hope you like it and that it inspires you to join our challenge this week or to try something different and 'out of the box' yourself! Thanks for stopping in today. I won't be around blog land too much in the next few days as my husband is back from Edmonton for 5 days so we'll be enjoying some well-needed family time! I hope you all enjoy a wonderful weekend though! First off...Happy Canada Day to you and your family! Enjoy your family time with hubby and kids! Your monkey card is way too cute. 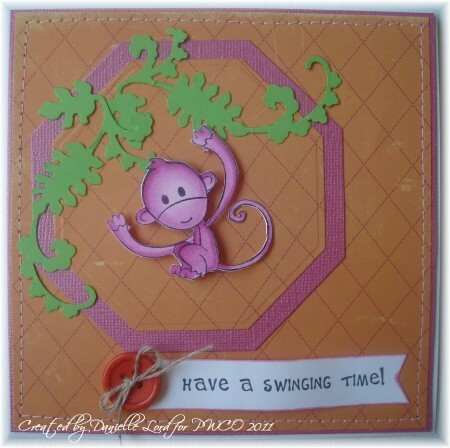 I love how you did the leaf vine and then had the monkey hanging! I adore your very sweet Christmas card. I must say, that has got to be such an adorable image! Great card love the image really cute. Hope you enjoyed the challenge. These are wonderful. I have to say I love the purple monkey. The angels are wonderfully colored, and the pearls finish it off so well.